EBM records presents the 44th offering of the "Thrash is Back" Series. Italian thrashers Sofisticator are on the loose again with the intention of wiping the floor with our fancy asses. They do pretty much that on their second album, Death by Zapping, counting on familiar and well-known elements that make Thrash sound like Thrash and nothing else. Fortunately, Sofisticator keep their stuff varied without relying too much on faster or slower moments but trying their best to find a balance between the two. At this they have succeeded, managing to put together an album which has all the different sides of ‘80s-tinged Thrash Metal covered. Did I hear someone say "Bay Area"? Sofisticator is influenced by the Bay Area sound more than anything and their melodies coexist with pounding Thrash riffs. Names like Vio-lence, Exodus, Death Angel and Heathen come to mind when listening to Sofiisticator music which is a good sign if you happen to be a fan of that famous sound. 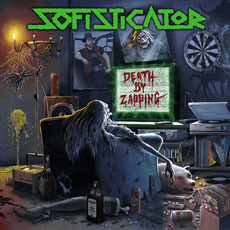 Death by Zapping shows Sofisticator’s career is on the upswing and hopefully they will further sharpen their performance in the future. Something even better may come out of it. Initially self-released by the band in 2014, this 2016 re-edition features 2 previously unreleased tracks as bonus. 3. Rot-Wash'n'roll 11. Who Saw Him? 4. Ok, The Price Is Right! 12. M.C.S.